merica is in the midst of an opioid epidemic. Consider that in 2012 alone, health care providers wrote 259 million prescriptions for opioid pain medication, enough for every American adult to have their own bottle of pills. 78 people die every day from an opioid-related overdose. To address this national health crisis, the Centers for Disease Control and Prevention (CDC) issued guidelines in March 2016 urging providers to reduce opioid prescribing in favor of safe, nondrug alternatives such as physical therapy for chronic pain conditions, including low back pain, hip and knee osteoarthritis, and fibromyalgia. In August 2016, the Surgeon General sent a letter to every physician in the country asking for their help to solve the problem. Meanwhile, the American Physical Therapy Association (APTA) launched a national public awareness campaign to educate consumers about the risks of opioids and the safe alternative of physical therapy for pain management. Physical therapists treat pain and improve function through movement and exercise without the risky side effects of opioids. A physical therapist's individualized, hands-on approach engages the patient, making her or him an active participant in her or his own recovery. The risks of opioids outweigh the rewards. CDC experts say that opioids should not be considered as first-line or routine therapy for chronic pain. Even when opioids are prescribed, the CDC recommends that patients receive "the lowest effective dosage," and opioids "should be combined" with nonopioid therapies, such as physical therapy. Pain or function problems are related to low back pain, hip or knee osteoarthritis, or fibromyalgia. The CDC cites "high-quality evidence" supporting exercise as part of a physical therapist treatment plan for these chronic pain conditions. Pain lasts at least 90 days. At this point, pain is considered "chronic," and the risks for continued opioid use increase. The CDC says that "clinicians should consider opioid therapy only if expected benefits for both pain and function are anticipated to outweigh risks to the patient." APTA's #ChoosePT initiative is raising awareness about the dangers of prescription opioids and the safe, nondrug alternative for pain management provided by physical therapists. 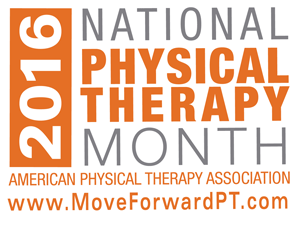 Visit http://MoveForwardPT.com for information to help you decide if physical therapist treatment is right for you.